The Ravishing Russian picks a fight with the Raw Women's Champion. 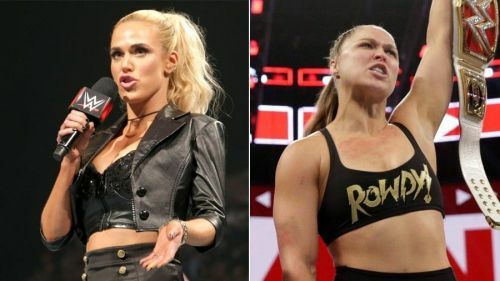 Ronda Rousey was upset at Vince McMahon for changing her match with Becky Lynch at WrestleMania 35 to a match against Charlotte Flair. She tweeted about her frustrations and it got the attention of her opponent for this Sunday's Elimination Chamber, Ruby Riott. Riott said that Rousey shouldn't overlook her, and Lana backed up Riott by saying that Rousey is 'overrated' and that she 'hasn't brought the ratings to Raw'. Fightful.com carried a report of all the tweets. Lana lost her spot to the winner of the Royal Rumble, Becky Lynch. But due to Lynch's action post-rumble, Mr. McMahon suspended her for 60 days, taking her out of the title match with Rousey in April. Ruby Riott actually gets the first crack at Rousey in the Elimination Chamber PPV and she feels that she's being overlooked by the Raw champion. Lana apparently agrees with the leader of the Riott Squad and has tweeted her support for Riott while also bashing Rousey. Riott took offense to a tweet from Ronda where she claimed that WWE wasn't doing what's 'best for business' by changing her opponents for the big match in April. Showing her support for Ruby Riott, Lana chimed in with her thoughts in support of someone she thinks might also be overlooked due to Rousey. A twitter user backed Rousey's drawing power, saying that Rousey drew over 1 million buys during her time in the UFC. Lana also replied to him and also might have referenced some other news that came out recently regarding her leaving Total Divas. News came out yesterday that Lana wouldn't be on the next season of Total Divas and that Sonya Deville, and possibly Rousey, would be. The series has hit a low in ratings there, so Lana's ire might also have stemmed from that report. Lana probably is saying what a lot of the full-time women in WWE are thinking regarding Rousey coming in and getting pushed to the moon so quickly. If Rousey was terrible in the ring, Lana might have some credibility behind her words, but Rousey is one of the best women wrestler's in WWE already. Maybe she's a little upset about losing out on her Total Divas' spot and the potential that Rousey is joining the show. But the funny thing is that Raw has had some struggles with its ratings over the last few months, so Lana does make a valid point regarding the ratings. Whatever the case is, Riott is right that she shouldn't be overlooked and she may be champion one day. Lana just should have shown her support with some different words or in a different fashion.